Lose the Love Handles faster with the latest CoolSculpting available. Click here to register for our February 5 Cool Night Out event. The CoolSculpting® procedure is the only FDA-cleared non-surgical fat reduction treatment that uses controlled cooling to safely target and reduce diet- and exercise-resistant body fat. At Rhett Women’s Center, we have sculpted hundreds of women and men. Michelle Polhamus is our certified coolsculpting specialist and provides treatments in the new, private Rhett Women’s Center Aesthetics Suite. Do you have stubborn fat that is resistant to diet and exercise? Request a consultation to see if the cool sculpting procedure is right for you. We are the only office in town to offer price matching. If you find a price lower than ours, we will match it. CoolSculpting® can be performed very efficiently in our practice as we can “dual-sculpt” with two machines at the same time with the new applicators that reduce the treatment time from 60 minutes to 35 minutes per cycle. 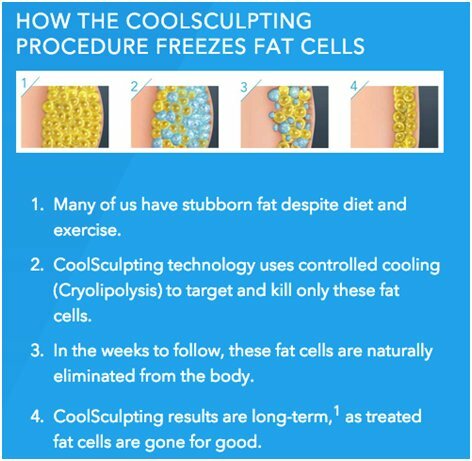 Cool sculpting gets rid of those stubborn fat cells by using controlled cooling (cyrolipolysis) on the specified problem areas. 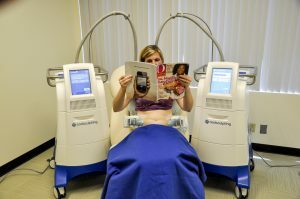 Cyrolipolysis freezes the unwanted fat cells without damaging your skin. Fat cells are more vulnerable to the cooling than the surrounding tissue so only unwanted fat is eliminated. The controlled cooling technique triggers the fat cells’ natural decay. Once the treated fat cells are crystalized (frozen), they die and are naturally processed and eliminated through the body. What’s the best part? Once the stubborn fat cells are eliminated, they are gone for good! At Rhett Women’s Aesthetics, we regularly meet men and women that are dissatisfied with look of their bodies. Many of our patients are healthy individuals in a normal body weight range, but even with diet and exercise they struggle to lose their love handles, belly fat, thigh thickening or arm flab. It’s important to know this accumulation of body fat may be out of your control. Excess body fat can be driven by a variety of factors – age, hormones, lifestyle and life in general. For example, as we age our hormone levels, especially estrogen and testosterone, decrease which causes fat cells to expand and areas of the body to expand. We will develop a customized CoolSculpting® treatment plan that addresses your expanding problem areas. This non-invasive procedure is safe, effective, and requires no downtime. We’ll come up with a customized treatment plan that fits your schedule, so you can return to your normal activities right after your appointment. Coolsculpting is the perfect way to get in shape for our on-the-go patients. Get rid of your stubborn fat the easy way with coolsculpting. Your CoolSculpting® provider will help you create an individualized treatment plan tailored to your specific goals. All CoolSculpting® treatments are performed by Certified CoolSculpting® Specialists and medically supervised by our physicians. Before your treatment, you will be weighed and measured. Our Certified CoolSculpting® Specialist will pinch areas of unwanted fat to determine if the area can be treated with CoolSculpting®. Initial photos will be taken of the area(s) to be treated. Your CoolSculpting® Specialist will determine which CoolSculpting® applicator is best suited for you. At Rhett Women’s Aesthetics, we use all the newest, updated CoolSculpting® applicators to offer the most comfortable, fast and versatile fat eliminating treatments. After we determine the areas and applicators, a gel sheet will be placed on the treatment area to protect your skin from the cooling technology. After, the treatment applicator cup will be placed over the stubborn fat. Over a duration of 35-75 minutes (depending on area treated), the new and improved CoolSculpting® applicator will use gentle suction to draw your fat tissue into the cooling cups which isolates the fat. If treating the outer thighs (75 minutes), the applicator is positioned with Velcro straps to ensure the treatment is delivered to the desired area. During the first 1-10 minutes, you may feel temporary discomfort because of the suction, pressure, and cooling. After that time, CoolSculpting® is generally very well tolerated. No topical or general anesthesia is needed. Depending on what area is being treated, you may be positioned lying flat or sitting up. Most patients read, listen to music, work on their computer, or simply sit back and relax and watch a movie or TV. Some patients opt to have other aesthetic procedures performed at the same time. We offer savings on injectables when paired with Coolsculpting. Once the treatment cup is removed, your skin will be red, cold, and firm. The treated area is massaged for an enhanced effect. Once the treated fat cells are frozen, they die and are naturally processed and removed by the body. Repeat treatments may be performed for additional fat reduction. The effects are not instantaneous, but they are long lasting. You may start to see changes as quickly as three weeks after your treatment. Most patients see the most dramatic results after *two to three months.